Iodine Poisoning is the accidental or intentional intake of the iodine containing compound. The intake may be through swallowing or inhaling vapors of such compounds. Iodine Poisoning is also known as Iodine Toxicity. What are the Causes of Iodine Poisoning? Note: The drug can interact with other prescribed or non-prescribed medications in the body. Such interactions may enhance the therapeutic effects of the drug or other medications being taken, resulting in undesired side effects. What are the Signs and Symptoms of Iodine Poisoning? The signs and symptoms of Iodine Poisoning can vary from one individual to another. It may be mild in some and severe in others. Several systems of the body may be affected. How is First Aid administered for Iodine Poisoning? Who should administer First Aid for Iodine Poisoning? 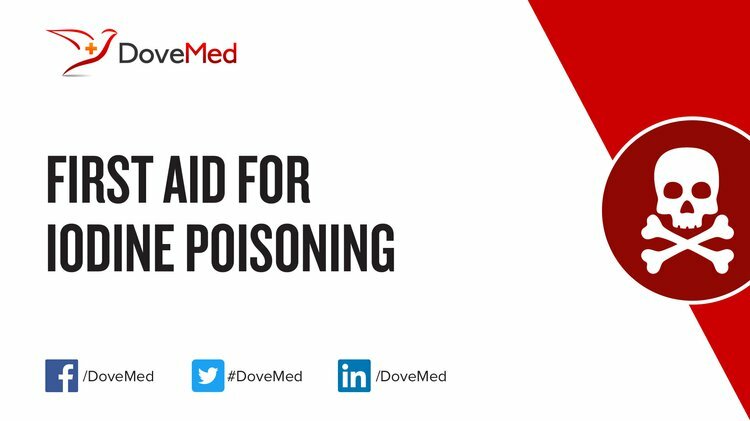 First aid for Iodine Poisoning is administered by healthcare professionals. What is the Prognosis of Iodine Poisoning? If the individual can recover from the symptoms with appropriate medication and support, the outcome is generally good. How can Iodine Poisoning be Prevented? Mao, Y. C., Tsai, W. J., Wu, M. L., Ger, J., Deng, J. F., & Yang, C. C. (2011). Acute hemolysis following iodine tincture ingestion. Human & experimental toxicology, 30(10), 1716-1719. Ochubiojo, E. M., & Rodrigues, A. (2012). Starch: from food to medicine. INTECH Open Access Publisher. Kalykova, A., Kustova, T., Sakipova, Z., Ibragimova, N., Islamov, R., Vetchý, D., & Ilin, A. (2016). Acute and subchronic toxicity studies of the original drug FS-1. Acta Veterinaria Brno, 85(1), 9-16. Lakhal, K., Faidherbe, J., Choukhi, R., Boissier, E., & Capdevila, X. (2011, August). Povidone iodine: Features of critical systemic absorption. In Annales francaises d'anesthesie et de reanimation (Vol. 30, No. 7, pp. e1-e3). Elsevier Masson. Küpper, F. C., Feiters, M. C., Olofsson, B., Kaiho, T., Yanagida, S., Zimmermann, M. B., ... & Kloo, L. (2011). Commemorating two centuries of iodine research: an interdisciplinary overview of current research. Angewandte Chemie International Edition, 50(49), 11598-11620. Sorimachi, K. (2014). Iodine poisoning. Reactions, 1495, 29-5. Woods, M. (2011). Iodine panic leads to poisoning. Science Education News, 60(1), 28. Paravar, T. (2017). Systemic Medications for the Dermatology Toolbox: Potassium Iodide–Handout for Key Points. ALAM, S. B., KHANDAKER, F. A., Karmokar, P., Hasan, S., KABIR, H. M., & MATIN, A. (2011). Mathematical Analysis of Poisoning Effect. World Journal of Engineering and Pure & Applied Sciences, 1(1), 15.